I'm not sure this was really necessary, but have you seen these? These are Kraft's new marshmallows. They are flat and square, the better to fit s'mores. When I was buying a bag of marshmallows to make s'mores, these were cheaper than regular large marshmallows. It grabbed them, not giving a care what they looked like. It wasn't until I actually set out to make s'mores in the microwave about a week later that I noticed the odd shape and then read the package. How do they work? Well, they are okay. For me, half the fun in making a microwave s'more is watching the marshmallow puff up and then shrink down. I'm not sure these get as gooey inside as the other, bigger, kind. I know big marshmallows tend to be less expensive than the miniature ones and I have, in the past, purchased the big ones and cut them down for recipes. These square ones will be much easier to cut if their price stays as low as it was. I tend to think this will be a niche market that won't last beyond a couple years. Still, they were fun to use. These would not work, I don't think, on the end of a stick held in fire. Mmmmm. That's the best way to make s'more, over an open fire on a crisp autumn evening with friends or family and the inevitable discussion. 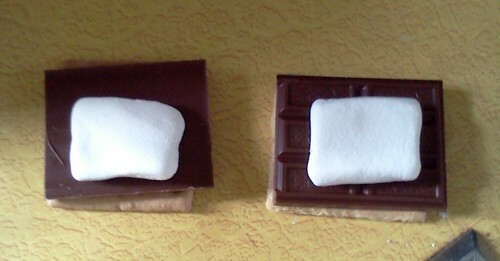 Which is better, a lightly browned marshmallow or a charred one?